TWRP for Zenfone Max Plus M1 download is now available from an unofficial build and this post guides you how to install TWRP for Zenfone Max Plus M1 and ROOT Zenfone Max Plus M1 (using TWRP recovery). After installing TWRP recovery on Zenfone Max Plus M1 you can install many android mods such as google camera (gcam), enable navigation gesture, enable face unlock, viper4android audio enhancement etc. and many more. THIS IS AN UNOFFICIAL BUILD OF TWRP FOR Zenfone Max Plus M1. FLASH AT YOUR OWN RISK. INSTALLING THE TWRP RECOVERY AND ROOT Zenfone Max Plus M1 NEEDS AN UNLOCK BOOTLOADER ON YOUR PHONE. DURING THE BOOTLOADER UNLOCK PROCESS ALL THE PHONE DATA WILL BE ERASED. MAKE SURE TO BACKUP EVERYTHING. Before installing TWRP you may require an unlocked bootloader on Zenfone Max Plus M1. Installing TWRP on Zenfone Max Plus M1 requires a scatter file to be created. 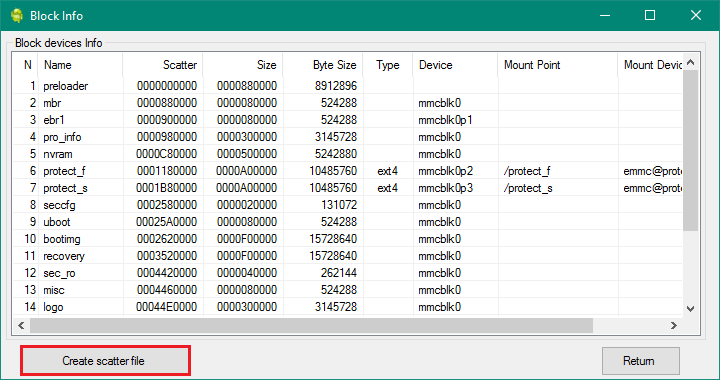 A scatter file of a Mediatek device is what tells about the presence of different partition and the start address of each partition. Either you can download the scatter file from the downloads section or you can create it by yourself using the following guide. This guide need the Droid MTK Tool. With the help of Droid MTK Tool we will create the scatter file for Zenfone Max Plus M1. Download the Droid MTK Tool from the above Downloads section. It’s in a zip file, so extract that file or open using WinRar or some application and then open the MTKDroidTools.exe file. Enable USB Debugging under Developer Options on the Zenfone Max Plus M1; to make the device accessible via ADB. – If you don’t know how to do this then here is How to Enable Developer Options and How to Enable USB Debugging and OEM unlock. Then connect the phone using the USB cable to the PC. – When you connect the phone to the PC, MTKDroidTool will show all the information about your phone. On the next screen you have all the partition information and starting address of all the partitions of Zenfone Max Plus M1. On the bottom of the screen you see a Create scatter file button. – Click on the button to create scatter file for Zenfone Max Plus M1. Save the scatter file for Zenfone Max Plus M1 in a location which you can remember and access easily. 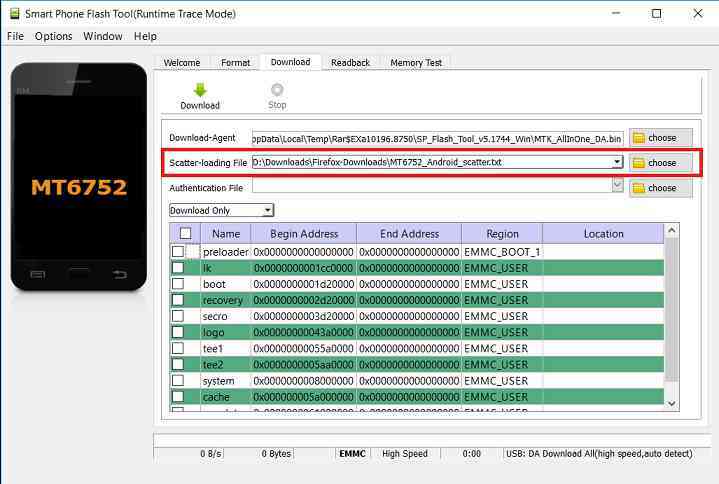 TWRP recovery download to a Mediatek phone is done by SP Flash tool, which uses a scatter file to know which address the recovery partition starts. Make sure you have downloaded the SP Flash tool and created the scatter file for Zenfone Max Plus M1. Follow the below steps to install the TWRP on Zenfone Max Plus M1 using the scatter file. Open the SP Flash tool zip file and then open the flash_tool.exe file. Click browse on the the scatter-loading file section and select the Zenfone Max Plus M1 scatter file you created earlier using the MTKDroid Tool. After selecting the scatter file, the SP Flash tool application automatically find available partitions and other details. 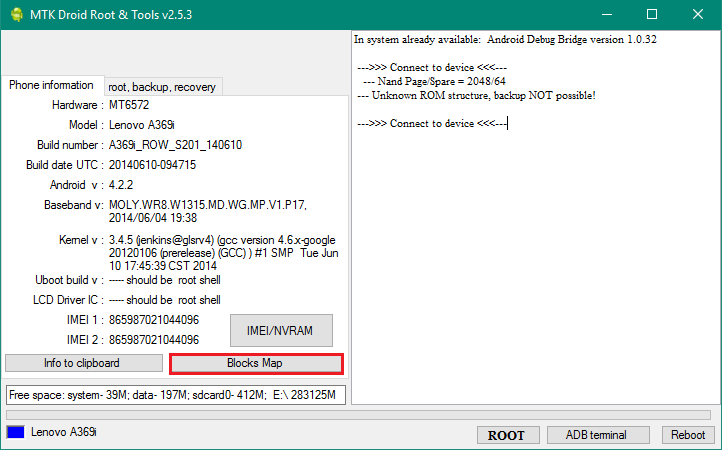 Now select the location next to the Recovery partition and select the TWRP for Zenfone Max Plus M1, which is in .img format. Then click on the Download button to start downloading/flashing of the TWRP recovery on Zenfone Max Plus M1 as shown in the picture. After clicking on the download button you will see a red bar on the bottom followed by a yellow bar. When the TWRP is downloaded to Zenfone Max Plus M1, the SP Flash tool will alert you saying Download is done. Well, this isn’t it. You can install customized themes, sound mods, Xposed modules etc. after installing the TWRP for Zenfone Max Plus M1. 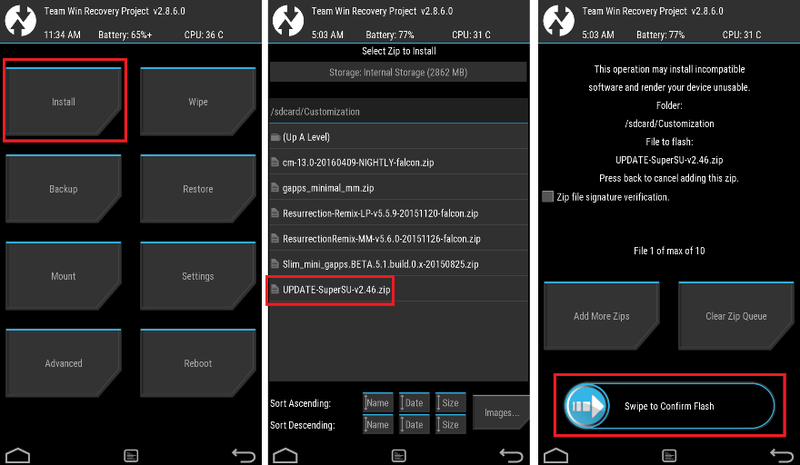 TWRP recovery is the gateway to many goodies for your phone. 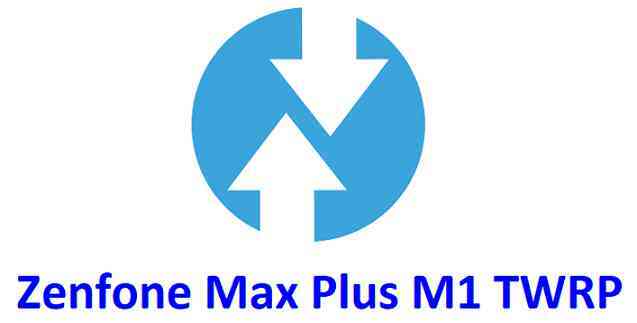 Now, if you want to ROOT Zenfone Max Plus M1 then below is a step-by-step by guide for the same. ROOTING Zenfone Max Plus M1 MAY BRICK THE PHONE. MAKE SURE YOU READ THE ADVANTAGES AND DISADVANTAGES OF ROOTING BEFORE YOU PROCEED FURTHER. – Well, this is a very important aspect of this SuperSU ROOT process. The SuperSU zip file is developed in a way to be installed via a TWRP recovery or other custom recovery. Stock recovery may not be able install this SuperSU or Magisk ROOT zip file. Your phone will not be rooted just by installing the SuperSU APK file on your Android phone. Now restart the Zenfone Max Plus M1 to boot into TWRP recovery. Flash or install the SuperSU or Magisk for Zenfone Max Plus M1, by Sliding the Swipe to Confirm Flash on TWRP screen. Wait for TWRP to flash the SuperSU or the Magisk. Once the flashing is done just reboot your device. Profit!!! You should now have a Zenfone Max Plus M1 ROOT enabled phone. How to check if ROOT is enabled on Zenfone Max Plus M1 or NOT? If you face any problems on this guide to install TWRP for Zenfone Max Plus M1 then, you can login and reply here. Either me or some other user on this forum will revert back to your query as soon as possible. Stay tuned or Subscribe to the Zenfone Max Plus M1 forum For other Android Custom ROMs, LineageOS ROMs, and all other device specific topics.